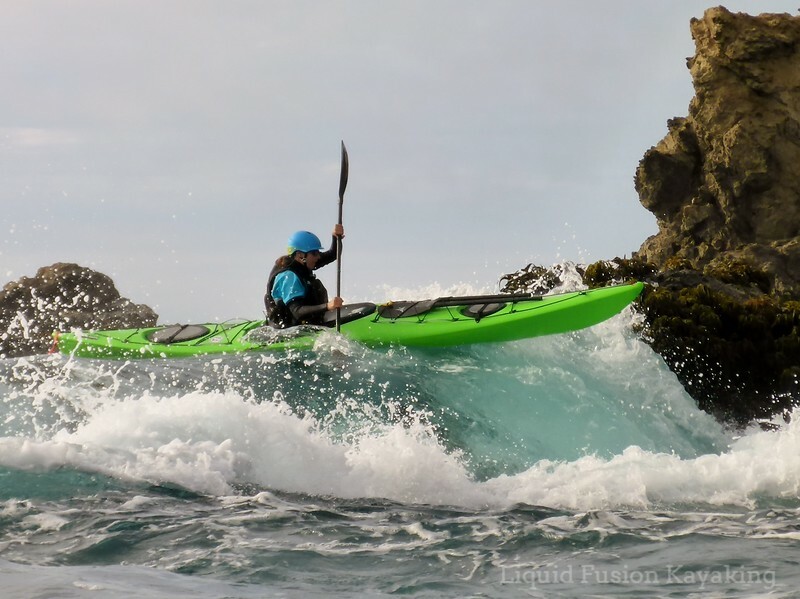 Improve your sea kayak rock garden and whitewater kayak skills by perfecting your vertical paddle stroke. A well timed vertical paddle stroke will boof you over hydraulics/holes on both the river and the sea. Boofing is super fun and helps prevent you from getting sucked back over pour-overs and getting trashed in a hydraulic. It is kind of like bunny hopping over an obstacle on a bicycle. One of the main components of an effective sea boof is a vertical paddle stroke. 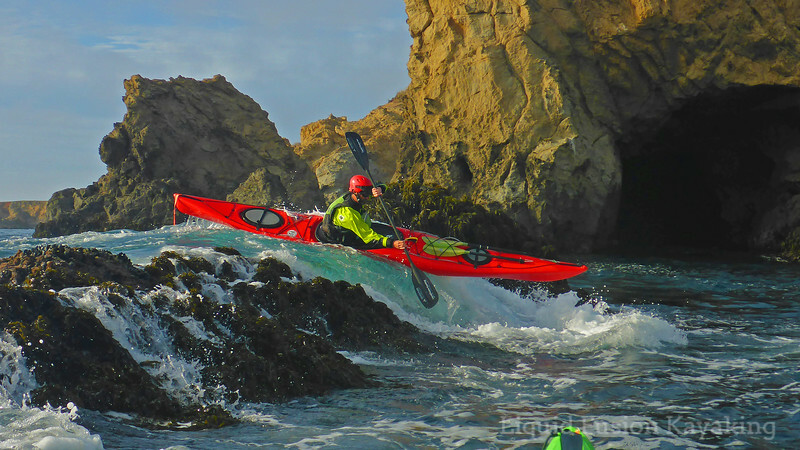 Cate Hawthorne using a vertical forward stroke to sea boof a rock garden feature on the Mendocino Coast of California. A vertical paddle stroke will also help propel you along through tight narrow spaces like slots and sea caves. 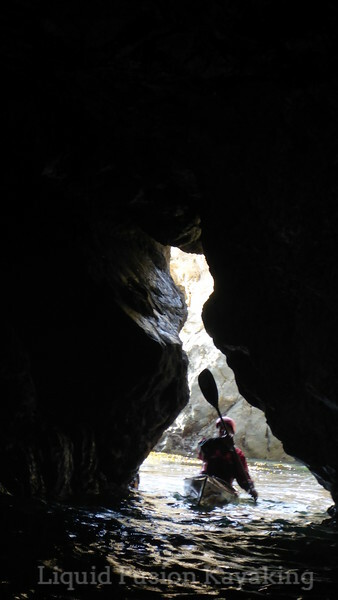 Sea kayaking through a narrow slot into a Mendocino sea cave. Flat water is the best place to practice and perfect your vertical paddle stroke. One of my favorite tips for getting the paddle vertical is to focus on stacking my hands. Pretend that you are using a single bladed paddle (canoe or SUP paddle). Align your top hand over your bottom hand so that your hands are stacked and your paddle shaft is vertical. For a vertical forward stroke, practice stacking your hands. Another common tip that instructors will use is "helmet hand." While doing your forward stroke, pretend that the back of your top hand is glued to your helmet (or forehead). Practice vertical paddle strokes as much as possible so that they become automatic in your muscle memory. Once you have a powerful vertical paddle stroke, you can work on the blade placement and timing for sea boofs. 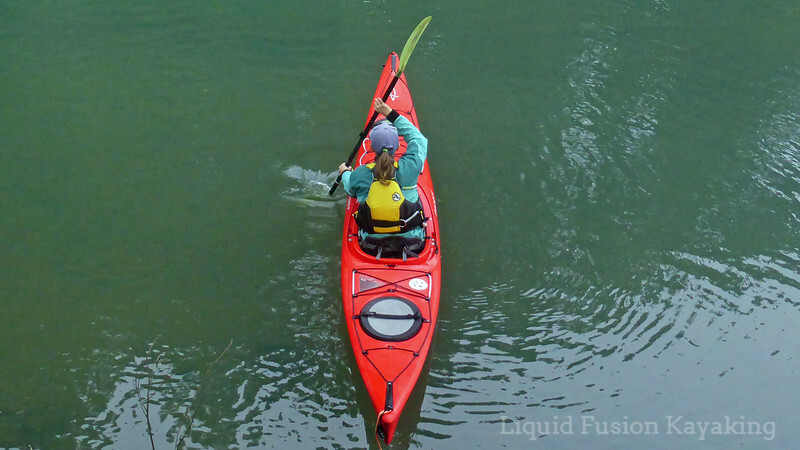 Liquid Fusion Kayaking's Jeff Laxier is the sea boof master. Thanks for clearly explaining this specialized use stroke.